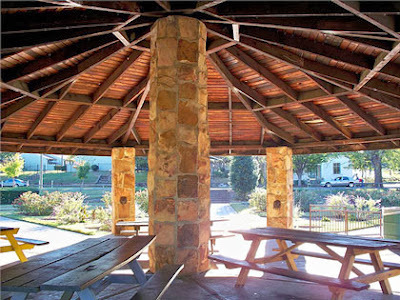 Our next Alabama Bloggers meetup takes place from 11:30 a.m. to 1:30 p.m. Oct. 18 at Avondale Park. We shall meet in the pavilion behind Avondale Library, rain or shine. Everyone is invited, so please spread the word! The hashtag is #AlaBlogMeet. • Bring your blogging question on a slip of paper; you don't have to put your name. Each person will draw one at random and answer the question. Make it fun! Please RSVP on this post or on Facebook event. 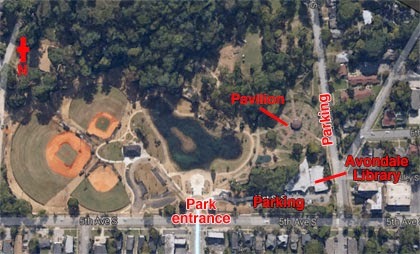 Avondale Park is located at 4101 Fifth Ave. S., Birmingham, 35222. Map. Free parking along 40th Street South and in the Avondale Library lot. P.S. 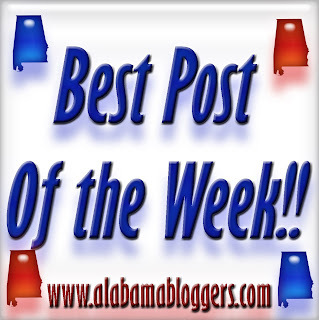 Join the Alabama Bloggers Facebook group. After a short summer break, it's time to get back together to talk about blogging! Our next Alabama Blogger meet-up will be on September 6 at 11:30 at Railroad Park. 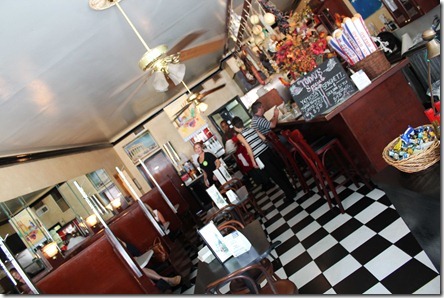 Feel free to bring your own lunch, or take advantage of George's Boxcar Cafe like I will be doing. There is covered seating, so we will meet regardless of the weather unless James Spann is telling us to go to our safe place. Everyone is invited, so please spread the word! The hashtag for the event is #AlaBlogMeet. We will have a roundtable discussion on how to strategically use Social Media Tools to promote your blog effectively yet without being pushy. Platforms that we will discuss include Facebook, Twitter, Pinterest, and more, so be thinking about how you use them and questions that you might have on using them more effectively. Please RSVP on this post or on the invite in the Alabama Bloggers Facebook Group. And if you're not a member yet, be sure to request it! Really – who wouldn’t love an excuse to visit Nashville? There’s a new kind of conference coming to Nashville in October, and it has something for everyone. KEEN Digital Summit is a three-day networking, digital media and brand development conference that will serve as the Omni Nashville's grand opening event from Oct. 24-27. It's an official partnership with the city of Nashville, and there are four tracks--family, technology, food/drink, travel--all of which will bring some of the top innovators in their fields to Nashville to share the latest in digital and mobile technologies, while offering a venue for connecting digital influencers with brands. I love this concept of covering so many topics, because let’s face it: Twitter has ruined my attention span. I’m used to reading 140 characters of philosophy, then seeing a sunset photo, then reading a vaguely angsty statement, then laughing out loud at a witty remark. And I kinda love it that way. So with the four focuses of this conference, I can jump back and forth as my attention span demands, learning from the top industry experts of each one. And regardless of how you use Social Media, you are certain to find a track that fits you. Plus, as a bonus, you will get to enjoy the luxury of being one of the first to experience a brand new Omni Hotel! They have reps from Ogilvy, Microsoft, HGTV, Southern Living, Expedia, Jeff Corwin's team and other big companies speaking on panels and conducting Q&As. And one of those fantastic experts happens to be Alabama’s own Erin Shaw Street from Southern Living! Also, students and recent grads can get their tickets for half-price – only $149 for the entire three day event! This giveaway will be open until Sunday, August 18. We will notify the winner on Monday, August 19. Disclosure: I was not compensated for this post, but was given a two passes to cover the event. All opinions are my own. Y’all Connect: A Social Media Beacon for Birmingham. On July 23, Birmingham hosted the first Corporate Storytelling conference in the world, Y'all Connect Presented by Alabama Power. More than 200 attendees came from as far as Oklahoma to hear a stellar lineup of speakers. Although the target market was corporate CEOs and Social Media Executives, I quickly realized that the networking opportunities and depth of information available at this conference was not just for the business world. As a blogger, I was able to visit with fellow local and national bloggers, increase my understanding of tricky subjects such as SEO, and glean tips on how to tell better stories. Alabama Power's Social Media Genius, Ike Pigott, opened the conference with his keynote address. He provided context for why storytelling is an important facet of communications - because facts are boring. We have infinite facts at our fingertips, thanks to the digital age. But storytelling is about leveraging a story to communicate better. An important point that he made was that stories should not be all about the teller - they are also about listening and understanding what role we play in other people's lives. I especially resonated with this important point, as I find my reader's comments and input equally important to my own story. Ike also stressed the importance of having a strong social media network. Your network can and will share information with you that you didn't even know you needed, giving you an edge over your competition. He also made the valuable point that because of the closeness of our network to our own lives, we will get much more relevant news from them than from any newspaper headline. After the Keynote, I attended Mack Collier's session based on his new book, Think Like a Rock Star. The premise of Mack's research is that rock stars can easily create and cultivate fans when companies simply cannot, and he set out to discover their secret. But what he realized is that there was no secret: rock stars simply go out of their way to create a deep and emotional relationship with their biggest fans, with the thought that doing so will create sales. While most companies focus on new customers, rock stars focus on brand advocates, who will market to new customers for them in a much more powerful way than they could accomplish by themselves. 1. Get in the face of your fans. Understand your fans because you're having constant interaction with them, and reward the behavior you want to encourage. 2. Give up control to get control - Fans look for ways to take control and want control - they want to act on your behalf and help you reach your goals. 3. Find the bigger idea behind the content you create. a. Raise awareness of ideas and news that's relevant to your customers. b. Be a teacher - share your knowledge. If you have a skill, teach others how to do this skill. This establishes your expertise. c. Create inspiring content - create customer centric content, and teach your fans how to use your product better. 4. Love the people that love you! Figure out ways to give your fans special access that isn't available to the general public. Ultimately, you should strive to have the mindset that your fans are the real rock stars, not you - a concept that is applicable to corporations and bloggers alike. Mack’s ideas were fresh and eye-opening – I hope to find time to read his book soon. I was also able to hear from Mitch Canter, who discussed how best to tell the stories you own; James Spann, who spoke about the changing Social Mediacentric world and how not to panic because of it; and my dear Twitter friend Jenny Schmitt, who taught us all about the Millennial Generation and how to reach them. And I agree – the chatting in-between was just as valuable as what I gleaned from the sessions. I was able to visit and deepen relationships at the pre-party, lunch, and snacks (although I skipped the after-party to get back to my family.) I left feeling exulted and enriched, excited about my city’s social media presence and leadership. I would highly recommend attending next year, which is currently slated to be June 2014. The Twitter Transcript of the conference is available here, and videos of all of the sessions will be available soon at the Y’all Connect website. All photos courtesy of Jack Wyrick/Y'all Connect. Rachel Callahan is a blogger in Birmingham, Alabama. She writes at Grasping for Objectivity and runs the blogging networking site Alabama Bloggers. I know some people might disagree. Some people might believe that blogging can't be too difficult since everyone and their cat (literally) seems to have one these days. But I believe that being a good blogger is no easy task. It takes creativity, consistency, and commitment. And I believe it also takes community. Writers need community. This is why I started See Jane Write Birmingham and See Jane Write Magazine. And this is why I love groups like Alabama Bloggers. Birmingham resident Rachel Callahan started Alabama Bloggers in May of 2009 because she wanted to connect with more bloggers in her hometown. Rachel had made connections with writers all over the world, thanks to her blog Grasping for Objectivity, but she wanted to get to know the bloggers in her own backyard. Rachel first launched the group as an online community then took these connections offline with monthly lunch meet-ups. I'll be hosting this month's meet-up which is set for 11:30 a.m. - 1:30 p.m., Friday, July 12 at Mix Bakery, 1819 5th Avenue North. Please RSVP by July 10. If you're a member of the Alabama Bloggers Facebook group you can click here to RSVP. If not, you can just RSVP in the comments section of this post. The hashtag for this and all Alabama Bloggers luncheons is #AlaBlogMeet. Hope to see you July 12. Mark your Calendar for Bloggers Who Brunch! 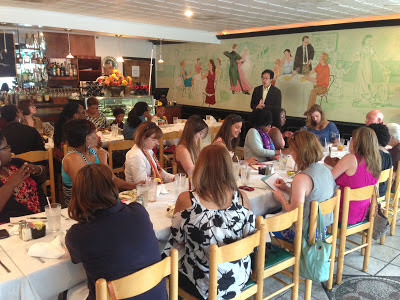 In lieu of the Alabama Blogger Meet-Up this month, I decided to encourage you all to attend the See Jane Write Bloggers Who Brunch event on June 21 at Nabeel's Cafe. Nabeel's Cafe is always the best of hosts, and Wade Kwon will be speaking on The Power of Digital Storytelling, which is the main topic of the upcoming Social Media conference, Y'all Connect. "While some people may see storytelling simply as a hobby or as entertainment, I see it as an art form and I believe storytelling helps hold us together as a society," Javacia explained. "Furthermore, good storytelling can help an entrepreneur promote her business and can help take a blogger's blog to the next level and that's what this brunch is all about." This event will be a great place to connect, learn, and eat a fabulous meal while doing so. I hope to see you there! Lunch is from 11:30 - 1:30. Be sure to RSVP for the lunch here, as tickets are limited.